EnTranCe is spread out over different locations, one of the research departments of EnTranCe is located in the Energy Academy building (Nijenborgh 6). The professorship Communication, Behaviour & the Sustainable Society is based in the Energy Academy. The professorship Communication, Behaviour & The Sustainable Society contributes to the establishment of a sustainable society through practice-oriented research into communication and behavioural interventions. A core question is how people can be motivated and stimulated to collaboratively create a more sustainable society. We-Energy Game, Check your Heat Loss and R-link are examples of ongoing research projects of the professorship. Many different organisations that work together to take positive steps towards a sustainable future are located in the Energy Academy. Among others, The New Energy Coalition and the UN Global Centre of Excellence on Climate Adaptation (GCECA) are based there. The Hanze University of Applied Sciences, the University of Groningen and the many different companies that are active in the field of climate and sustainability make Groningen a perfect location for the international centre of knowledge on climate adaptation. 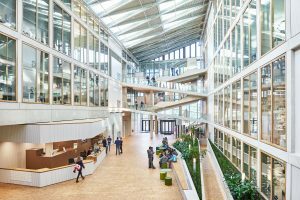 The Energy Academy building is the most sustainable education building of The Netherlands.The new building is designed to inspire, exchange ideas, be innovative and to generate energy. The unique design demonstrates how a building can make optimum use of the natural elements earth, water, air and sunlight as a primary source of energy. The sloping roof is entirely covered with solar panels, the optimal set up of these panels has been tested at the testing grounds of EnTranCe. In 2017, the building received the international BREEAM Award in the category ‘Mixed use & other’. In that same year, the building was hailed as the most beautiful building of Groningen. Want to know more about the Energy Academy building? Watch the video below. EnTranCe | Center of Expertise Energy wants to accelerate the transition to a clean and affordable energy supply. In our expertise center, scientists, students, companies, governments and social institutions meet each other to share their knowledge. Together we provide the innovations that are badly needed for the energy transition and we strengthen the regional knowledge economy. Stay informed – Sign up for our newsletter: EnTranCe | Centre of Expertise Energy. Het Transfuture Festival viert op 12 juni haar eerste lustrum. Houd de datum vrij! Het programma is volop in ontwikkeling, maar we kunnen alvast verklappen dat Manon Janssen @JanssenManon, boegbeeld van de Topsector Energie @TSEnergie, het festival aftrapt met een #BarnTalk.